March 16, 2016 – On the high plains of El Paso County, Colorado in the shadow of Pike’s Peak, a group of twenty-somethings hold the technological fate of the world in their hands. Just a few years out of high school or freshly minted from college, these individuals share a common bond of responsibility in shepherding and maintaining a silent fleet of sentinels high above their heads. Since ancient times, humans have looked to the heavens to find their way home. The mariners of the past used the constellations in the night sky to guide their way on the high seas. Today, instead of stars, we use a constellation of satellites known as the Global Positioning System and hand-held devices from smartphones to tablets to get us to where we’re going, safely and reliably. GPS provides location and timing information in all weather conditions, anywhere on or near the Earth where there is an unobstructed line of sight to four or more GPS satellites. The precise time transfer and highly accurate positioning data of this space-based navigation system has revolutionized nearly every aspect of modern warfare. GPS has enabled U.S. and allied forces to strike targets with pinpoint accuracy while reducing collateral damage. Equally important, GPS has brought significant benefits to more than three billion civilian users worldwide in diverse applications including air, road, rail and marine navigation, precision agriculture and mining, oil exploration, environmental research and management, telecommunications, electronic data transfer, construction, recreation and emergency response. The United States government created the system, maintains it, and makes it freely accessible to anyone with a GPS receiver. In reality, GPS is made up of three parts: satellites, ground stations, and receivers. The satellites act like the stars in constellations — we know where they are supposed to be at any given time within a small range of error. The satellites broadcast their location to the ground stations, and the ground stations are able to detect and correct that error in future uploads to the satellites. When the satellite’s location is more accurately broadcasted to the receivers, the receivers can calculate a more accurate position. A receiver, like you might find in your smartphone or navigation system in a car, is constantly listening for a signal from these satellites. The receiver figures out how far away they are from the satellites in view. Once the receiver calculates its distance from four or more satellites, it knows exactly where you are within a few yards of your actual location. 2 SOPS operators – enlisted personnel and officers in their mid-twenties on average – man the master control station at Schriever AFB and operate a dedicated network of worldwide monitor stations and ground antennas to control and support the GPS constellation. The monitor stations track navigation signals from GPS satellites and gather data on satellite performance. This data is then processed at the MCS and is used to update the satellites’ navigation messages. 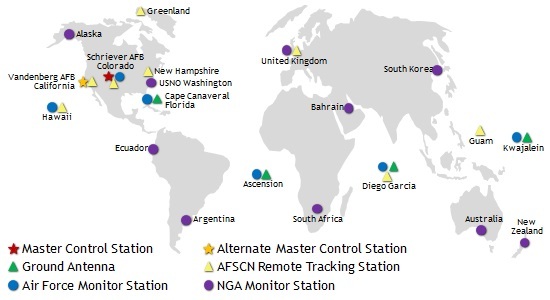 The MCS sends updated navigation information to GPS satellites through dedicated ground antennas located at Kwajalein, Ascension Island, Diego Garcia, and Cape Canaveral, Florida as well as via the Air Force Satellite Control Network. These ground antennas transmit commands to satellites and receive the satellites’ state-of-health information. The updates sent from the MCS synchronize the atomic clocks aboard the satellites to within a few nanoseconds of each other, and adjust the ephemeris, or diary of each satellite’s internal orbital model. The updates are created using an algorithm known as a linear quadratic estimation or Kalman filter that compiles data from the ground monitoring stations, space weather information, and various other inputs. 2 SOPS had historically partnered with 19 SOPS to conduct launch, anomaly resolution, and disposal operations, or LADO. LADO includes satellite activation, initial checkout and maneuvering to mission orbit. The two squadrons also use LADO to respond to satellite emergencies, support end-of-life testing and execute satellite disposal operations as required. Currently, the GPS constellation is healthy, stable and robust with 12 GPS IIRs, seven GPS IIR-Ms, and 12 GPS IIF series of satellites on orbit providing precise global positioning, navigation, and timing services to users around the globe. The latest generation of GPS IIF satellites provides improved signals to support both the warfighter and the growing civilian applications. Featuring a new third civil signal — L5 — that benefits commercial aviation and safety-of-life applications, the GPS IIF series provides improved accuracy through advanced atomic clocks, and a longer design life than previous GPS satellites on orbit. Ancient mariners would be amazed by the speed and ease of pinpointing your location today, thanks to the team behind the GPS constellation.